With the exception of books on self-help, co-dependency and 12-step recovery programs, the hottest items in Christian bookstores nowadays deal with spiritual warfare and related topics. Some of the new doctrines regarding angels, demons, territorial spirits and Christians being possessed (or controlled by demonic forces) would be laughable were they not so spiritually lethal. I hope to show some of the erroneous ideas that have bred this new doctrine of spiritual warfare and the connection between these false ideas and other devilish doctrines in the church today. We certainly do not deny the validity of spiritual warfare. But we insist on a biblical understanding and perspective on teaching the ways of warfare for the believer. Much teaching today on the subject is certainly not biblical and therefore not helpful in the least to Christians. In fact, much that is being taught at warfare conferences, in books and on tapes is damaging to the individual Christians involved and to the church as a whole. And it is bringing reproach upon the name of Jesus! The deluge of books and teachings on spiritual warfare seemed to follow closely the publications of two books by Frank Peretti called This Present Darkness and Piercing the Darkness in the mid 1980’s. I've read the books and enjoyed them. There was actually some sound instruction to be found about the networking of the New Age movement, Satanist and a variety of other anti-Christian forces. But these books are novels, works of fiction, the creation of the vivid imagination of Peretti. They are not textbooks on angels and demons. While they provide us with word pictures of what spirit beings may look like and give us a sense of the struggles taking place in the spirit world, the books must be recognized and read as fiction. I don't plan to get into a detailed examination of these two books, but I feel we need to understand the roots of some of these "new revelations" about spiritual warfare. I'm sorry to report I have heard those who used to be sound biblical preachers now claiming to have had frequent visitations by angels and demons. Again I'm not denying the reality of these entities; I merely point out that the frequency of their appearing, has, I believe directly increased in proportion to the number of books being sold about such manifestations, be they fiction or nonfiction. The thing that intrigues me most about some of these reports is that the individuals' descriptions of their "visitors" seem to be taken directly from Peretti's books. It seems all angels have flashing swords and all demons are suffering from sulphurous halitosis. There is a growing trend among people to live out the experiences that happen to characters in books they have been reading. In Peretti's books, the demons and angels all have names and certain warfare gifts or talents and each has control over a territory. There are demons for cities, for schools, and all other larger and smaller political subdivisions and edifices, including churches and govemment offices. People who create such an unscriptural list of demon powers are often involved in what they call a "deliverance ministry." They analyze the possessed person's problem and they cast out the demon of whatever. Some, as you've probably heard, have Christians and unbelievers alike vomiting these demon spirits into bags as part of the service. God help us lest we fall for such theatrical foolishness. I have yet to find anywhere in Scripture that says the preaching of the gospel, or the success of that preaching, is contingent upon territorial spirits being bound. My Bible tells me the gates of hell - that is, the strategies and powers of satanic forces - shall not prevail against the church and its primary mission of preaching the good news of Jesus Christ. I believe if we'd waste less time trying to bind demonic forces and spend more time preaching the simple, unadulterated gospel, the evil influences that are ever present would flee. These bizarre binding activities are merely extensions of Peretti's doctrine of territorial spirits and imitations of media ministers who have raised many dollars and many hopes of claiming to cast all the demons out of major metropolitan areas. Thousands have gathered in Miami, in Detroit and in San Francisco. They have prayed, rebuked and railed against the powers of darkness. Yet, as any resident of those cities can tell you, there has been no decrease in lawlessness, perverseness or ungodliness since these mighty warriors invaded. In fact, about the only result has been a media laughfest at our Lord's expense. Even the prestigious Wall Street Journal couldn't resist a front-page article several years ago about the efforts of some Christian leaders to exorcise the demons of homosexuality and other sins out of the City by the Bay. Such arrogant new groups of militant Christians have yet to demonstrate one successful campaign over territorial spirits. No matter how much authority they claim and how many times they march around the territory, victory has eluded them. If their doctrine concerning demons is true, then God must have failed. Since we know from Scripture, and not new revelation, that God never fails, the only safe conclusion is that their doctrine is wrong. Some such leaders may claim their warriors did not have enough faith, but I don't think that excuse will hold up. It should be noted that many in the Word of Faith group, who have claimed great riches, have merely transferred their authority to this area of spirit life. Much of this devil-chasing doctrine is an added perversion of the Word of Faith message that says we are gods and have all authority over devils and angels. Much of this modern warfare teaching stems from another new stream of unbiblical Kingdom Now/Dominion teaching that claims, among other things, the church is to take over the world, to regain the dominion that Adam lost in the Garden and then to rule the world before Christ comes. We should ask ourselves a few questions at this point. By what scriptural authority do these dominionists claim the right to banish evil entities from our cities? Where is the scriptural precedent for “taking our citv for Jesus”? And who owns this present world system? Who Is The God Of This Age? God is actually in charge of all powers, and they rule by His permission. Paul said in Romans 13: 1, "There is no authority except from God, and the authorities that exist are appointed by God" (NKJV). If the situation in “this present evil age” is ordered by God, then not even the church has authority to overthrow it. This will happen when God ordains, and by His own presence and judgment on earth. Those who have not been born again by the Spirit of God are under the authority of their father, the devil. Their lives, possessions and interests are given over to him. We have no right to challenge this ownership, however much we would like to. For a believer to command that Satan release one of his willing servants would be as futile as Satan trying to force a believer to sin against God. He can tempt us. But he cannot control our will. The devil doesn't have that authority over us, and we don't have that kind of authority over him. "The only legitimate challenge is the offer of salvation. This having been refused, we can do no more. What applies to one man, surely applies to towns and cities and nations. Those who submit to the rule of Satan's hierarchy of rulers are their legitimate bondslaves. Only those who believe themselves to be the new masters of mankind would challenge Satan's rights of ownership." These militant Christians are not content to defend the faith and share the gospel. The feel they must thrust it on society. They assume an attack mode which flies in the face of Christ's teaching that the meek shall inherit the earth. Note particularly the contrast between the meekness advocated by Jesus and the aggression promoted by these modem-day warriors. Too, consider the difference between an inheritance and a conquest. 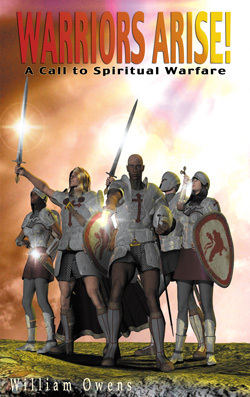 If these Christians in full armor would only realize the majority of their warfare garb is for protection and defense, they might assume a more Christlike posture in their dealings with the world of evil spirits. The only offensive weapon in the Christian's arsenal is the "sword of the Spirit which is the word of God" (Ephesians 6:17). That is the only weapon at our disposal. It is all that is needed to resist the devil. That's all Jesus used when He was directly and personally attacked by the adversary. He didn't call a legion of sword-wielding angels to chase the devil away. Neither did He rebuke, or bind or rail against Satan. He merely resisted his temptations with the Word of God. Three times during, the wilderness temptation (Matthew 4:1-11) Jesus merely said, "It is written." And verse 11 tells the result of such resistance: "Then the devil left Him" (NKJV). James 4:7 tells us, "Submit yourselves .. to God. 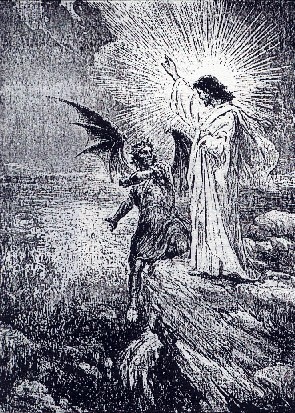 Resist the devil, and he will flee from you." If we are Christ's disciples, we should follow His example. Resist the devil with the Word of God. When Satan comes against us in any area of our life, there is a complete and satisfactory response in the Word - if we only know it. When a “messenger of Satan" buffeted Paul, he didn't rebuke the Enemy nor call a conference on spiritual warfare. He appealed to God. He knew the Scriptures. He knew "the battle is the Lord's" (I Samuel 17:47). And what was God's answer? He didn't give Paul the teaching on "the weapons of our warfare." God said, "My grace is sufficient" (2 Corinthians 12:9). He told Paul He would be with him through it all. He never gave him a new revelation on how to defeat Satan. Satan is already defeated. And because he is, we can believe God that His grace is sufficient. Jesus Christ, the incarnate Word, is all we need for life and godliness (2 Peter 1:3). Nowhere are we commanded to rebuke the devil; just resist. We have no authority to bind Satan, despite what some teachers claim. We can cast out demons; we can pray against Satan's attacks (oppression, not possession) on brothers and sisters in Christ; we can resist the devil with God's Word, with prayer and with the power of the Holy Spirit. But we cannot bind him. Satan is the prince of the power of the air. This evil world is his domain and he truly holds sway over his kingdom. He cannot, and will not, be bound until Christ himself does that prior to the 1,000-year reign of Christ on this earth.